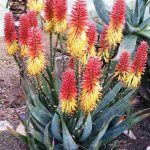 Q: When do aloes flower? Q: Are there easy to understand words for some of the technical terms used? Q: Will an aloe hybrid classified as small eventually grow big and tall? Q: Can an aloe sustain sunburn? Q: Why did my potted aloe hybrid rot when I watered it again after a month? 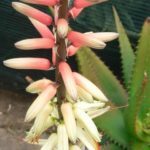 Q: Should I have earthworms in my aloe pots? Q: Do poisons and insecticides affect the birds and bees that visit the aloe hybrid flowers? Q: One of my tall stemmed aloe hybrids has fallen over. How do I prevent this? 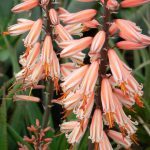 Q: How deep can I plant a large aloe hybrid? They keep falling over.